Kancheepuram is called the city of temples and truly to the word the city is bustling with temples in every street of the city. Kanchipuram can be virtually divided into Shiva Kanchi, Vishnu Kanchi and Jain Kanchi based on the idols worshipped in the temples. 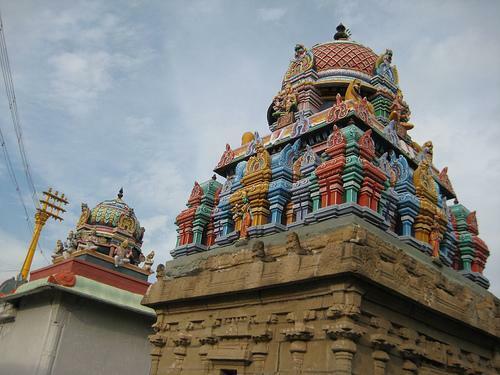 Based on this division Ulagalanda Perumal temple is located in Vishnu Kanchi. Ulagalanda Perumal temple is located in Big Kanchipuram and is situated nearby Sri Kamakshi Amman Temple. It is one of the 108 Vishnu temples known as Divya Desams, as depicted by the 12 great Tamil poets, in their work, known as Alwars. There are three Divyadesas within this temple, Tiru Neeragam, Tiru Ooragam, and Tiru Karakam. It is said that except Tiru Ooragam all the other two temples were built elsewhere but bought together later together. Sri Ulagalanda Perumal Temple, Kancheepuram-631 502. Opens: From 7.00 a.m. to 12.00 a.m. and from 4.00 p.m. to 8.00 p.m.
Road: Ulagalanda Perumal temple is less than 1 km from the Kanchipuram central bus stand and Srimatam. According to Bhagwad Purana, once an Asura king named Mahabali took over the authority of heavens by force and dispelled Indra. Mahabali was the grandson of of Hiranyakshipu, the son of Prahlada. The residents of heaven went to Lord Vishnu to save themselves from wrath of the asura king, it is then Lord Vishnu took the Vamana avatar and descended to save the heaven. The story goes like this, Mahabali was known to be very generous king and had gain immense power through severe austerities and penance, but he was blind with power so much so that he started considering himself the ultimate king of the world which bought his downfall. To bring about his downfall, Lord Vishnu once took Vamana avatar (form of a short priest) carrying a wooden umbrella and went to Mahabali asking for three paces of land. Mahabali consented after which Lord Vishnu took gigantic form and strode form heaven to earth in one step and from earth to netherworld in the second step, no place was left to put the third step of the gigantic Lord, seeing that Mahabali offered his head to keep the third step. Lord Vishnu placed his foot and blessed Mahabali with immortality for netherworld. Vamana in gigantic form is known as Trivikrama. 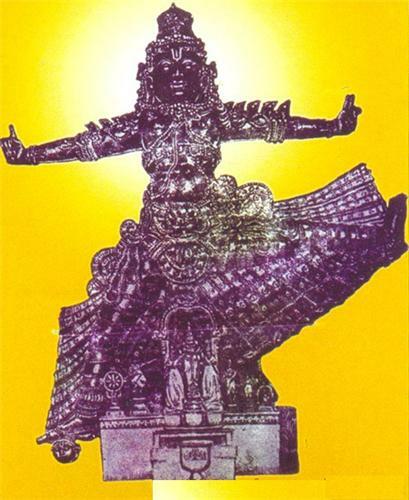 The main deity of Ulagalanda Perumal temple is known as Trivikrama owing to the gigantic form of Lord Vishnu. The deity is about 30 feet in height, his left leg is seen lifted at a right angle (to the body), parallel to the ground and the right leg can be seen placed on Mahabali’s head. The two fingers in the left hand is stretched out symbolizing the two steps that was taken by the lord covering the whole word, one finger in the right hand of the deity is stretched out symbolizing the question posed to Mahabali by the Lord as to where shall he put his third step. Such as gigantic deity cannot be seen anywhere else in other Divya Desams. Since the temple is built in the Pallava reign the structure and design has a distinct Pallava style architecture but the inscriptions on it are from the Chola Period. The inscriptions refer to the main deity as Thiru Uragathu Ninru-arulina Swamin. The inscriptions depict various scenarios in Chola periods like a weaver who reclaimed some temple lands, tax-free gift to the temple of the village of Siruchembakkam, Another interesting inscription in the reign of Cholas was the description of the minutes of a meeting of 48,000 residents of Kanchi. In the Tamil month of Thai (mid of January month to mid of febraury month) a special festival known as Garuda seva is celebrated. Doing Thirumanjanam (divine bath to Perumal) for Ooragathaan is said to cure all sorts of problems. Another important festival is Vaikunda Ekadasi celebrated in the Tamil month of Margazhi (mid of December month to mid of January month).